What is a WiFi AD or AX Router? In the almost two decades since the first 802.11 wireless standards were introduced, five general-purpose WiFi standards have emerged: 802.11a, 802.11b, 802.11g, 802.11n, and 802.11ac. With each new standard, progressively faster WiFi speeds were introduced. Now a new standard is coming, dubbed 802.11 AX router (11AX or WiFi AX), that focuses on improving WiFi performance in environments with a high amount of data traffic and overlapping networks. Think of wireless standards as a sort of Rosetta Stone for your WiFi-enabled products—they make sure that all of your wireless gadgets are able to communicate with each other. This is important, since WiFi enabled product shipments will reach 15 billion by the end of 2016—that’s a lot of devices that need to be able to cooperate. The 802.11 standard is evolving quickly, with each new version outpacing the last. Over the last 12 to 18 months, the latest WiFi standard (802.11ac) has gained notable market share. 802.11ac devices are incredibly fast, and blow the speeds of the previous standard (802.11n) out of the water. We know it can be tough keeping track of the whole 802.11 family, so let's stick to the real up-and-comers, the standards you'll be relying on for seamless 4K Netflix-ing in the very near future—their names are 802.11ad and 802.11ax. Though it might seem simplistic, WiFi actually works a lot like radio—signals travel along on various frequencies or "bands," like the common 2.4 GHz and 5 GHz bands. If WiFi is the heart of your connected home, these bands are the arteries that keep it pumping. But too much action on a single band can cause things to become congested. If you're streaming Hulu and downloading the latest iPhone update while your kids play Splatoon all on the 2.4 GHz band, your speeds will suffer. That's why 802.11ad is creating its own fast lane, operating on a 60 GHz band that’s completely separate from all of today’s WiFi standards and frequencies. And it really is fast—in addition to skirting interference, it packs speeds of up to 7 gigabits per second (Gbps). When just one gigabit equals 1,000 megabits, it’s quite the jump from 802.11n's average speeds of 300Mbps. Streaming from your PC or smart device to your smart TV or Chromecast. Transferring hefty media files, like 4K footage or raw images, at the office. A word of caution, though. Despite the unmatched speed it advertises, some WiFi product manufacturers may not support the 802.11ad standard if they feel it provides limited benefit to consumers (most of us do not require such lofty speeds, after all). Today's iPhones, Samsung Galaxies and their smart device cousins support the 802.11ac standard. Its exclusive use of the 5GHz band keeps your whole house or office connected, with a combination of speed and range that makes it a solid choice for streaming, gaming, or just browsing Instagram. So while the 802.11ad standard seeks to deliver incredibly fast WiFi speeds over a short distance, the upcoming 802.11 AX router standard will serve as the speedier successor to the more versatile 802.11ac. It will also maintain backwards compatibility, something 802.11ad won’t offer. To help encourage this sort of throughput, devices on the new standard will use MU-MIMO (multi-user multiple input-multiple output) technology, which uses antennas to send data streams to multiple devices simultaneously. If you've ever tried to access WiFi at a concert or in an airport, you're already aware of the limitations of WiFi in particularly dense environments. Essentially, an overabundance of users trying to pull a wireless signal simultaneously creates too much stress on the network, resulting in decreased performance and signal instability. A wireless AX Router tackles this issue, offering a better system for routing the data where it needs to go. The focus of previous wireless standards was mainly to achieve maximum theoretical speed. Building upon the most recent wireless standard, 802.11ac, which broadened multi-antenna capabilities through multiple input multiple output (or MIMO), 11AX further divides the frequency band into multiple channels using a technology called OFDMA (or "Orthogonal Frequency Division Multiple Access"). As a result, the 802.11 ax router can significantly increase wireless speeds and better manage network capacity, especially with heavy traffic and overlapping networks. How Fast Is AX WiFi? Comparatively speaking, the maximum speed of a single 802.11ac stream is roughly 866Mbps, whereas a single stream of AX WiFi is 1.2Gbps (that's gigabits). That means streaming Ultra-HD 4K video with zero lag, downloading entire software packages in the blink of an eye, and incorporating an entire family of smart devices. The speeds you'll realize, of course, depend on the network and the equipment set up on it. A large, enterprise network in a massive corporation – on that has an already-powerful signal already – will naturally see much higher speeds than those networks typically found in less dense residential or small business environments. Either way you deal it, though, you'll notice an increase of about four times the current signal, which amounts to a significant bump in total network capacity. The bottom line on speed? In addition to improving efficiency and coverage, wireless ax router is engineered to increase capacity of both 2.4 GHz and 5 GHz bands in a variety of environments, from homes to schools, businesses to airports, stadiums, and more. It doesn’t really matter what you’re starting with; garnering a connection that’s four times your current speed is going to make a noticeable difference in your online experience. How Efficient Is 802.11 AX WiFi? Speed isn't the only factor, however. An AX router is also focused on implementing mechanisms that serve a consistent and reliable stream of data to more users. That means an increase in efficiency and on maintaining connections, even when network congestion is heavy. The key issue here that WiFi AX addresses is interference. As more devices become connected in densely covered areas, congestion significantly slows the network. Users might experience co-channel interference, a degradation of performance, and none of the expected gain from wider channels. The WiFi 802.11 AX standard operates on both the 2.4GHz and 5GHz bands, preserving existing channel bandwidths and prioritizing network capacity and how data is transferred to multiple devices. AX WiFi also supports Orthogonal Frequency-Division Multiple Access (or OFDMA), a technology designed to improve the capacity of mobile LTE networks. In its current application, every time a router sends information to a device, it uses all the bandwidth in the channel, regardless of the type of data or how much information is actively being transmitted. With OFDMA, these channels can be split up, thus increasing the amount of data that can be sent and received simultaneously. Additionally, the new AX router standard allows you to schedule “awake” times when communication is permitted (thus reducing power load). It supports 1024QAM encoding, which means that more information bits can be transmitted per symbol (or pulse) and it also supports long OFDM symbols for greater channel bandwidth and less interference. Streaming movies and TV shows in 4K, Ultra-HD. Quickly downloading large files, like full retail video games. Playing those games online without experiencing the dreaded, Call of Duty-ruining "lag." Seamlessly using your entire family's collection of smart devices without noticeable speed sacrifices, since 802.11ax is designed for WiFi-dense environments. Keeping all your smart home devices running 24-7 with maximum WiFi coverage. Because it improves the average data throughput per user, the AX wireless router standard is best for high density environments such as apartments, condominiums, multi-dwelling buildings, and campuses. When multiple users’ devices are connected to the same network, they're forced to compete for available resources and transmit data sequentially, one at a time. Thanks to AX WiFi, multiple devices can simultaneously transmit data, using the same radio frequency and the same network. When it comes to AX routers, it’s not just bumping the speed of the network itself. It’s improving performance and solving the problems caused by overcrowded, congested WiFi networks. If your home WiFi already feels slow, even when you know your Internet connection is more than adequate, an AX router can be a critical upgrade. 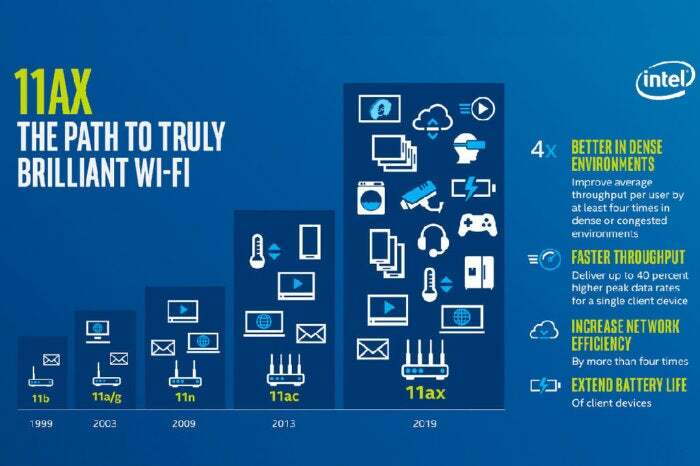 Extreme Tech: What is 802.11ax WiFi, and Will it Really Deliver 10Gbps?